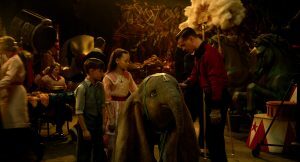 Former circus star Holt Farrier (Colin Farrell, righ) and his children Milly (Nico Parker) and Joe (Finley Hobbins) vow to stick with their beloved flying elephant the whole way in DUMBO. ©Disney Enterprises, Inc.
That’s the first thing eccentric filmmaker Tim Burton reveals when asked about venturing into the world of “Dumbo,” the classic Disney story about a baby elephant who, despite his freakishly large ears and also because of them—becomes the star attraction of a traveling circus in the post-World War I Midwest. Remaking a beloved film—the original animated “Dumbo” was released in 1941—is a tricky proposition for any filmmaker but in the hands of Burton, who has reimagined other classics like “Alice in Wonderland” and “Batman,” moviegoers are in for a whole new spin around the big top. Using a combination of live-action and CGI, the new “Dumbo” revisits the story of a baby elephant with a perceived deformity that winds up being the basis for a remarkable and unlikely gift. He can fly. Nurtured by two of the circus family’s children after he is separated from his mother (following a disastrous debut performance), the little elephant becomes the star attraction. As news of Dumbo’s ability spreads throughout the land, it draws the attention of a greedy impresario who makes a deal with the small circus’ owner and then tries to exploit the little pachyderm for all he’s worth. The circus family, meantime, decides to try and reunite Dumbo with his imprisoned mother, even if it means risking their own jobs. Burton may not be a fan of actual circuses, but his vast body of work clearly shows he is an advocate for outsiders and oddballs (“Edward Scissorhands,” “Ed Wood,” “Corpse Bride,” etc.). 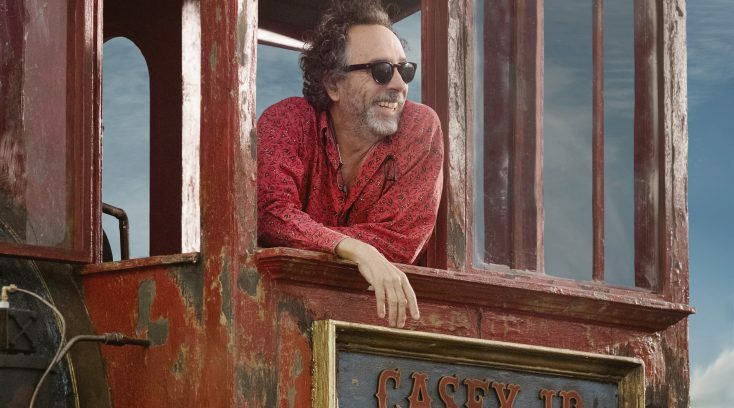 For “Dumbo,” Burton has gathered an eclectic group of actors he previously has worked with—Michael Keaton, Danny DeVito and Eva Green—with newcomers to his eclectic world—Colin Farrell, Alan Arkin, Nico Parker and Finley Hobbins. Q: Are you a fan of the circus? Burton: It’s funny. I like the idea of it. I like that sort of concept when you’re a child running away to the circus. It’s just a phrase that sort of stuck with a lot of people. Not the circus per se, but the idea of being with a bunch of other weird people from around the world that can’t get regular jobs. Farrell: I’ve never seen the circus except in the world of Tim Burton’s imagination. Q: Eva, you play an aerialist in the film. What was it like being on the trapeze? Green: I’ve always been petrified of heights, a real phobia. Thanks to Mr. Tim Burton, I have overcome my fear. I trained. DeVito: You give a talented person like Tim a subject like “Dumbo,” with all the great meaning, messages and metaphors, and what does he do? He sends it off into the stratosphere. He’s one of a kind. He’s just amazing and we love him so much. Burton: I just liked the idea of it. The idea of a flying elephant and the character that doesn’t quite fit into the world and how somebody with a disadvantage makes it an advantage. It just felt very close to the way I felt about things. It was just a very pure simple image. All the old Disney fables had that kind of simple symbolism for real emotions. I just like the fact that it’s obviously a very simple fable; a very simple story. At its heart, it’s about family. What I liked about it was the human parallel story. This character, Holt (Farrell), who comes back from a war missing an arm. He doesn’t have a wife. He doesn’t have a job. He’s trying to find his place in the world. All of the characters actually are in that way. They want to be something. Everybody is trying to find their place in the world, like Dumbo, and using their disadvantage to an advantage. So, there were lots of nice themes but in a very simple framework. both. I was playing a father who was disenfranchised from his kids, disenfranchised from a life that he left behind that is completely different by the time he comes back from fighting in the war. He’s physically a different man. He’s lost his left arm. He’s seen a lot of brutality. We don’t get into all of that psychological stuff so heavily because we want the film to be able to be received with the importance of the messages that are in it rather than hitting them all over the head. But my characters’ journey was one in just accepting his position as father and how that meant that all he had to do really was get out of his children’s way and let them be who they are. Green: It’s just such a wonderful movie because it has that message of: it’s okay to be strange or different. It’s actually great. It makes you special. We just have to embrace our uniqueness. Q: Eva, can you expand on the training that you did in order to first of all conquer your fear of heights, but also to be this performer in the circus? Green: I had the most amazing circus people who were very patient, very kind with me because I was absolutely petrified. I thought I would never be able to do that. For two months, every day, I trained. You need like a very strong core as well. Have very strong abs. Very strong arms. And then, little by little, I went higher and higher and higher. I found a trick. It was to sing, in French, and off you go. I surprised myself. It was a miracle. Burton: There were a couple of times that she couldn’t do it for safety reasons. Green: We had my stunt double Catherine Arnold. She’s just the most amazing aerialist. She was my teacher, and she was very patient. I’m just in awe of the circus people because they work so hard. They’re so dedicated, and they train and train. They’re ready to sacrifice themselves almost because they constantly have to overcome their fear as they put themselves in mortal danger. Actors, we’re nothing compared to those kinds of superheroes. Q: Tim, how was it working with this cast? Burton: For me, there are two different things. It’s a weird story about a weird family. It was very special to me to work with people that I’ve worked with: Michael, Eva and Danny. Colin, I feel like I’ve worked with him for many years, because he’s got the same kind of spirit. Meeting Nico and Finley and Alan Arkin (was great). Having a weird dysfunctional family is like the movie circus, which is very beautiful and important. The spirit of all of them really meant the world to me in terms of what the movie is and the spirit that they all put into it. I had one thing in the back of my mind. All of the people had to look kind of weird naturally, in a good way. Farrell: Coming from an actual dysfunctional family, I felt like I fit right in. Q: Danny, having worked with Tim Burton previously on “Big Fish” and “Batman Returns,” what was it like this time around? DeVito: When Tim called a year ago or so and said he was making the movie, I was really thrilled to be able to be part of it. The joy factor went up through the roof when I heard that Michael (Keaton, who co-starred in “Batman Returns”) was in it with me. Keaton: The joy factor was the first thing Danny reminded me was he got to be the hero and I got to be the bad guy. He was just thrilled with that. DeVito: Him in the mask and the whole Batman thing. It’s just getting too much for me, and me always being the gross penguin grunting and groaning and stuff. It was really so nice to be with him in the movie and everybody who is in the movie with us all together. We’re all weirdos but there is one really weird daddy down in the end (Burton). He’s pulling all the strings. Q: Tim, do you see this movie as a companion piece to “Edward Scissorhands,” another film of yours about an outsider? Burton: Not necessarily, except the fact is that theme comes up because I can’t help it. It’s like part of your DNA. It’s not that I consciously think about that but once you’re branded that way, no matter how you feel, that’s the themes that keep recurring to you. Q: Michael, you wear a pretty snazzy suit and wig in this as the villainous impresario V.A. Vandevere. How important is your costume and makeup in creating a character? Keaton: Once you feel the clothes and you start walking around in it. I remember in “Johnny Dangerously,” I immediately knew where to go when (I had the costume and makeup). When I was talking to Tim about Vandevere, I had in the back of my head, “I’m not going to mention the wig.” But as soon as I said, “Hey, this is probably a dumb idea but what do you think about a wig?” And then (Burton’s) eyes lit up, and I was thinking, “Now, I’ve got to wear this stupid wig.” But I dug the wig and the wig now has its own agent .I do like going to extremes, so any time you’re with Tim, there is always the likelihood that you’re going to go to some kind of an extreme look, or something like that. Q: What was the biggest challenge of making this live-action/animated film? Burton: We had this great cast and the only thing that’s missing is the main character (which is entirely CGI). That’s a very, very unnerving thing to kind of be going into something and you know what you want. You know what you’re trying to go for. You can even see rough animation. But until it materializes, you just don’t know. So, all these people are suspending disbelief for everything to make (the audience believe) the main character there and believable. That was the biggest challenge. Q: Danny, was your ringmaster performance based on Tim Burton? DeVito: Everything I do in the movie is basically fed to me through the insane mind of Mr. Burton. I felt really great to be Max Medici and be part of this insane family. The great thing is that it is a family and it is Max trying to keep everything together and keep all the elements up in the air. Tim just works 24/7 when he’s making a movie, keeping everything going, keeping the plates spinning, keeping all the balls in the air, keeping everything moving. All the moving parts congealing. Everything going together. So, I feel like he’s an inspiration when we’re on the set and it pushes you to new heights.